Seasoned investigator Claire Caswell and legendary Miami Dade state attorney, Gaston ''Guy'' Lombard, once again merge their acclaimed talents to tackle the most elusive of criminals in Road to Omalos. This time, when a gun-wielding man barges into the office of Caswell & Lombard, Private Investigation, the case takes the investigators from the steamy city of Miami Beach to Crete--the Greek island of romance and mystique. Arriving in Crete, the sleuths begin to track down the infamously dangerous target of their search. Unbeknownst to Claire and Guy, a group of merciless vigilantes also hunts for the same man . . . but for a very different purpose. 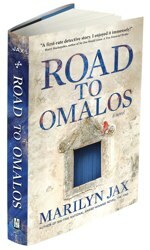 Road to Omalos, with its rich throng of characters and colorful cultural history, interlaces a powerful tale of suspense, enchantment, and murder, as the search for a sociopathic criminal pegs the investigators and the vigilantes against each other in a perilous race to final justice.